Are there any more heroes? Not in this game! I'm not the type to review games until I've beaten them (if the game can be beaten, that is) and I wasn't about to change that for however long it's been since I last posted. Let me just say this, if you have a Wii, you like messed up humor, and you enjoy action games, you should be playing this game, so while it's not needed, you should probably click for the full review. Before you do, perhaps you should drop a hot steaming save first. 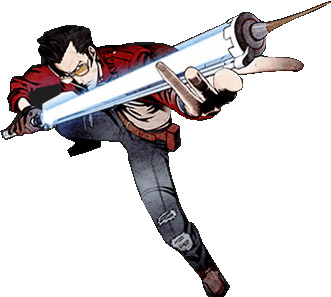 In NO MORE HEROES, you play as Travis Touchdown, an otaku with a preference towards "moe" anime characters, who's suddenly thrust into the world of ranked assassination fights. Using a "beam saber" he won off of an Online Auction, he travels around the town of Santa Destroy killing other assassins just so he can get in a French girl's pants. I'm not joking. If you didn't already know this, I feel a little bad for you, but if that alone doesn't hook you, there's just about every bad action film stereotype within the game, not to mention all sorts of reality breaking events. It's been a long time since I played a game where the characters were aware of the fourth wall, so references to a so-called "game" and "player" were pretty funny to see. I wouldn't call it literary genius, but I don't expect much out of video game developers these days. Goichi Suda made an interesting game on what looks like a low budget, though. I would go as far as to compare this game to a low budget action film, but I see that as part of the charm. I'm not a stranger to low budget movies, and sometimes I will go out of my way to see them, especially if they were reviewed highly. My one gripe with this game? The grindy minigames, and every ranking fight requires a fee! In order to get the cash for that fee, you need to work, and it's always increasing. Plus, there's the other things such as Beam Saber upgrades and Gym workouts to increase stats, and when you add it all up (especially maxing out the final weapon), you're looking at quite a bit of a timesink. Overall, the game took me a little over 14 hours to finish, though I'm sure a New Game + (you keep everything earned in your previous game, also you are allowed to fight in the hardest difficulty) would go much faster. I'd say this game is worth a purchase, but it has as much replay value as you are willing to give. The later assassination missions (#18 in particular) give enough money where only the final upgrades are a grind, but you don't have to worry about that in subsequent games. If you go in expecting a low budget game, you will probably enjoy it as much as I have. Verdict? BUY("Dolly" Llama approves! ), but due to length, try not to spend too much, or you may be disappointed.